Growth Habit: Horehound is a bushy spreading plant that grows to 75cm in height. The base of the stems is woody. The leaves are grey-green, hairy and crinkled in appearance. Flowers: Fairly insignificant white flowers arranged in rings around the upper part of the stems. Fruit/Seed: Flowers die off leaving a spiny burr. Each burr contains 4 small brown or black seeds. 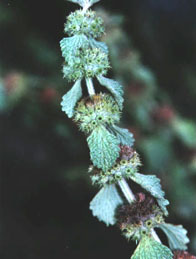 Dispersal: Horehound was sold in Tasmanian nurseries as a garden or medicinal herb from as early as 1845. The plant now spreads when the burrs attach themselves to passing animals in fur and wool and on to peoples clothing. It is spread by water along drainage lines and creeks. Distribution: This plant is found throughout Tasmania often around old farm building. It is most troublesome in the Midlands grazing areas. It is drought tolerant and is able to quickly increase its range when hot dry conditions limit the growth of other plants. It does best in alkaline soils. Status: Horehound is a Declared Noxious Weed in Victoria, South Australia parts of New South Wales and Western Australia. It is a Declared Secondary Weed in Tasmania. Horehound is very bitter. Grazing animals tend to concentrate on other plants in the paddock cutting down the competition and leaving Horehound to spread. If animals are forced to eat Horehound, their meat has a strong offensive smell and flavour. The most significant effect of the weed is that the burrs attach themselves strongly to wool and are difficult to remove. The sale price of the wool will then be down graded. Because the plant is drought tolerant, it can use the occasional drought to suddenly increase its range. Historically, Horehound was used for a number of purposes in the early days in Tasmania. These included its use as a herbal medicine for humans and stock and as a bitter flavouring for beer making. Horehound honey was highly prized. For further information on Horehound contact the Department of Primary Industry, Water and Environment, Tasmania (Declared Weed Leaflet, A/ W5, 9/1988).